The king trumpet, eryngii or king oyster mushroom is the largest of the oyster mushroom genus and, unlike other oyster mushrooms, their stalks aren’t tough and woody to eat. Instead, they're hailed for their meaty texture and umami flavour. 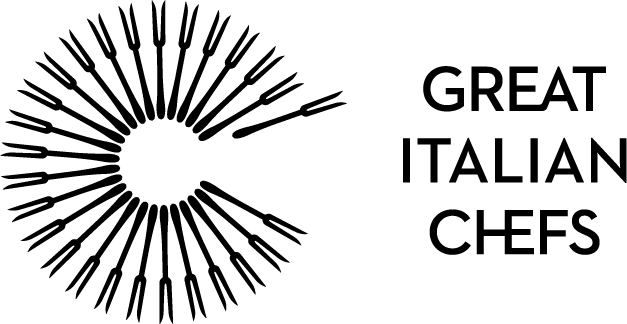 Native to the Mediterranean, they are perhaps most commonly used in Asian cuisines such as Chinese, Japanese and Korean; three countries where the mushroom is cultivated on a large scale. This impressive mushroom averages between 10–15cm in length, has a long shelf life in the fridge (roughly one week) and doesn’t lose its shape when cooked. 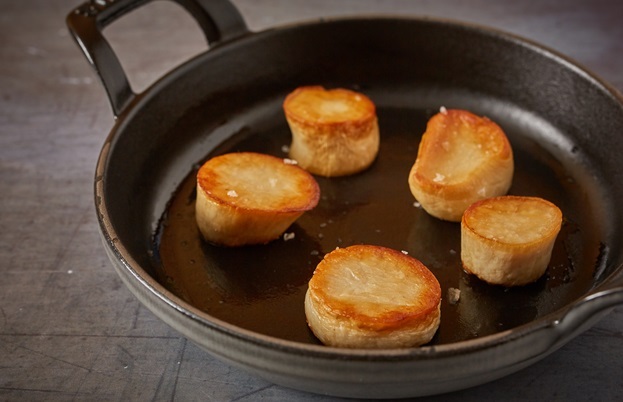 The texture is sometimes likened to abalone or scallops, which makes them an interesting option for vegetarians and are often billed as ‘mushroom steaks’ or ‘vegan scallops’. When buying king oysters, you want to select them carefully as they don’t come cheap! 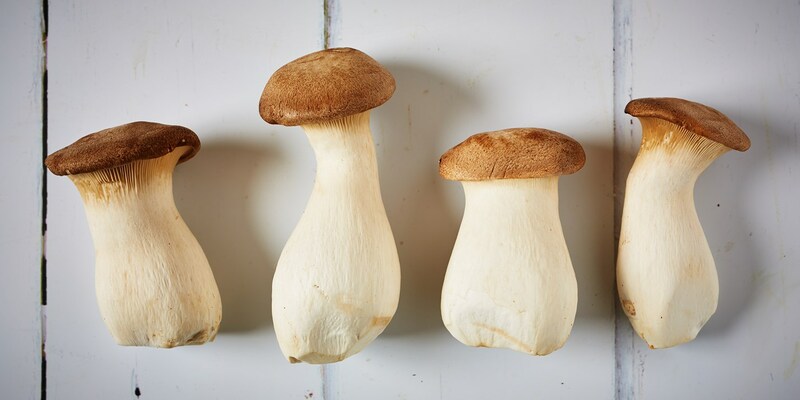 Choose mushrooms with firm, unblemished stems. They usually come nicely trimmed and free from dirt or soil but if you do notice any dirt, gently brush it off instead of washing them. The caps are quite delicate so be sure to select unbroken ones if you’re after beautiful presentation. If you are eating the mushrooms raw and finely sliced, select smaller mushrooms as they are said to be slightly stronger in flavour. Once cooked however, the mushroom's natural umami flavour is unleashed, so size doesn't matter – go as big or as small as you like. The mild taste of king oyster mushrooms means they are great at taking on strong flavours such as soy sauce or garlic. That's why Matt Gillan pairs pan-fried slices of the mushroom with a rich soy sauce gel and a spoonful of umami-packed mushroom and Parmesan orzo. In another dish, he serves them with the adventurous flavours of truffle, a blue cheese crumble and a sharp cherry vinegar gel. If you want to celebrate the umami flavour of the mushroom itself, simply cook some in foaming butter and finish with chopped soft herbs, a squeeze of lemon and a generous sprinkle of crunchy sea salt. Serve with eggs for a luxurious veggie fry-up. Japanese cooks are particularly fond of king oyster mushrooms – you’ll find them fried in crispy tempura batter served with dipping salts and sauces, or skewered whole and grilled and glazed yakitori-style across the country. The mushroom's robust shape and texture also makes them fun to experiment with; Ollie Dabbous serves them raw and sliced very finely for a fresh flavour and crisp texture in his dish of Warm veal rillettes, mushroom shavings and pickled garlic buds. 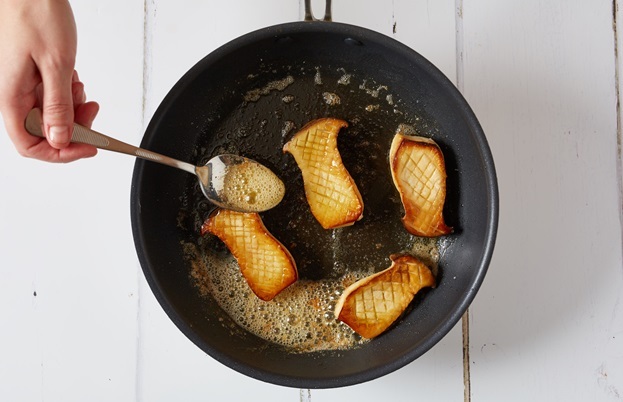 A popular vegan dish sees the stems thickly sliced into ‘scallops’ and pan-fried in good quality oil until cooked through. Sprinkle with seaweed powder for an extra taste of the sea.